The worst part about having a dog is losing them. No matter how old and decrepit a dog is, making the decision to say goodbye is painful. This is my dog Gracie. 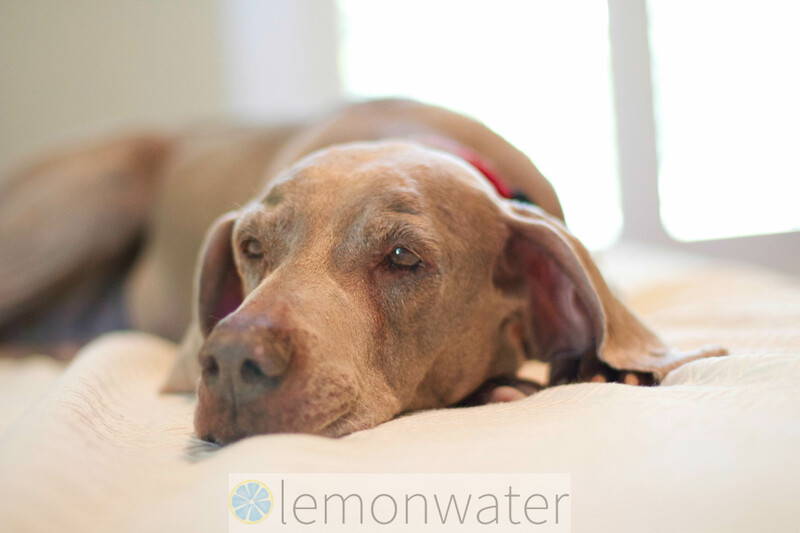 She is a 14 year old Weimaraner. Unbeknownst to us, Gracie was very skittish. She’d been abused and neglected, as is often the case with breeder dogs. She was scared senseless of people and even more so of other dogs. If you tried to touch her, she would bite you. She was our very first foster dog and I didn’t know what to do. I called the rescue group I worked with and they told me that we could not place a dog like that for adoption, so I needed to have her “put down”. This was seriously my FIRST foster dog and I needed to have her euthanized? No way. We had to keep her. I started working with Gracie using positive reinforcement dog training – no punishments, only praise and rewards. I wanted to build her confidence in herself and trust in others. We worked together religiously and every day she got better and better. If you were to meet Gracie today, you would have no idea that she was termed the “psycho dog” ten years ago. Today, she is the sweetest girl around. She will rub her face on your leg so you’ll pet her and she will politely nudge your elbow when you’re eating so you’ll drop some food her way. Most impressively, she is patient with Oliver when he rams a truck into her leg. She is gentle and dainty and so, so sweet. I am so proud of everything she has overcome and the type of dog she has become. Gracie’s age is an estimate because, of course, we don’t actually know when she was born. But, whatever the actual number, she is old. Especially for a big dog. She can hardly stand up, she can no longer wag her tail, and she doesn’t want to go for walks. Recently, Gracie has developed incontinence, which is an extremely unpleasant problem, especially with two other dogs and two small kids in the house. We have tried several different medications, retraining, chiropractic, acupuncture, even doggie diapers. But nothing is working. We believe she has spinal cord damage which is not reparable. Tomorrow we are taking Gracie to the vet again. I know what the outcome will be and it is a reality that I have been secretly crying about for weeks. We have run out of options and I know it is time to say goodbye. She has had a good life with us. I wish we could make it last forever. I sure do love this girl and I am going to miss her like crazy. She taught me more than I ever wanted to know about patience, humanity and communication. I hope her road to heaven is paved with peanut butter and chicken liver. Praying for you and the family today. Miller is 15 and I know the end is near as well. These rescues certainly capture our hearts. Hugs for you as you let Gracie go to the rainbow bridge today. Your post just resulted in my dog getting the biggest hug ever. She’s a four year old rescue and we just love her to pieces. Thinking of you as you say good bye. God will bless you for the kindness you have shown this wonderful creature, all of animals that have touched our lives and hearts will be there for us when it is our turn to pass. Gracie has had a wonderful life with you and I believe she will understand when it is time for you to let her go. I had rescued a lab in 2001 that had many issues we had to overcome, we worked through them over the years and he was the best dog anyone could ever want. We lost him in 2012 to a heart attack/stroke at the age of 14 or so we think. The other dogs miss their big brother, and so do we. Letting go is the hardest thing we do for our furry loved ones, but sometimes the kindest.